Pic's from all over the globe - I mean, at least the 'Southern California' part! Make Extra Income Sharing What You Love! Shooting off the cannons for the group of middle school kids out to experience the ocean today! Click on the pic to read the full story at http://SailingWithAlbie.blogspot.com"
"Exy's big cannon blasted off at us and smoke fumed out over the sea. The shot rang and echoed in our heads nearly making our teeth rattle! A cannon ball shot over my head. Hold on, did I just say that? I meant to say a grape fruit. 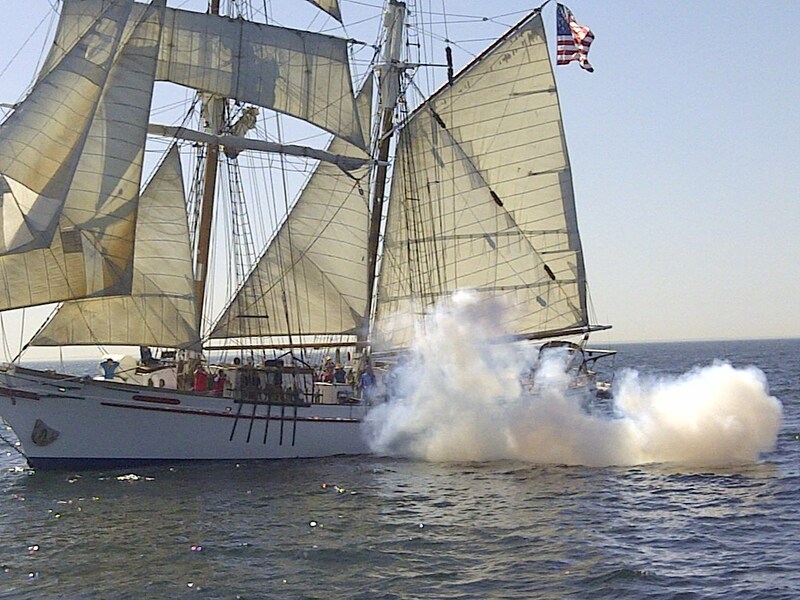 Because that's what we shot out of the cannon on the way back from Santa Barbara Island. Or was that from a big sling shot I'm thinking about? Oh well, whatever it was, nothing really shot over my head except my active imagination and a lot of smoke! Soon the Exy was blanketed in the grey stuff and I couldn't help but think how cool it all looked. For the next few hours we tacked and beat into the south westerly wind - always keeping our eyes out for the Exy Johnson's position." Santa Ana Gusts at Sea! 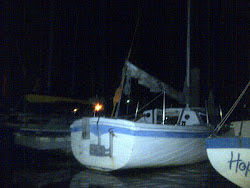 Tonight, I was just sailing along when a wall of wind hit the boat, pulling it over on its side. Everything that wasn't secure inside the cabin went flying all over the floor. What a rumpus and racket it made! 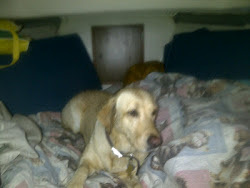 Buttercup (my wonderful golden Labrador) and I went super fast through the waves as the gusts pulled the starboard side of the boat down toward the waters edge. Wow! How exciting! 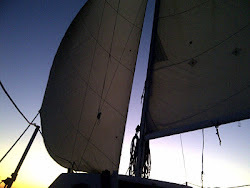 It was gusting so hard though, that I began to wonder how much pressure the big genoa sail could take? I was beginning to wonder if taking it down and replacing it with the smaller sail might be a better idea. Waiting five minutes or so is usually a good idea, so I did and just used the 'fishermans reef' temporarily - letting wind spill out of the sails to keep the boat at a safe angle. I was glad I waited, for the gusts declined in intensity and I was able to get back to the harbor safely. One more problem arose - that of my battery. So without navigation lights I made make shift red and green port/starboard lights from a see-through green and red cup and put flashlights inside. Then I arranged them on the correct side of the boat and what do you know! They worked great! 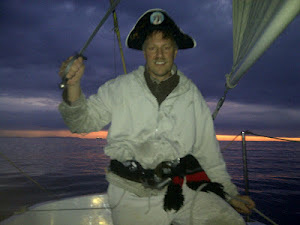 All in all a very interesting night sail. Tonight the wind is blowing softly, little lights from neighboring yachts and docks flicker across the water, my kerosene lantern is sending out a warm glowing light from off of the stern of my boat and I feel at peace. 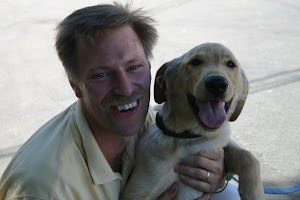 Buttercup, my Golden Lab has already jumped off the boat onto the dock as I pulled into my slip and now waits patiently for me to drop the sails and fold them up neatly and then take her for her well earned walk. Tonight on NOAA, the weather report said the wind to be 10-15 knots of wind and tonight with possible gusts to 20 knots. So I knew there was going to be some wind - or at least the odds were stacking up that way. 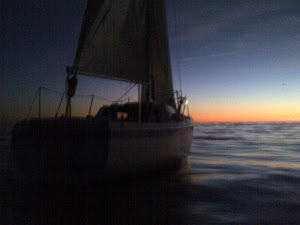 So I put up the sails and headed out around 8pm. Sunset had already come and gone and so it was dark now. The wind was very light and after attempting to tack, I had trouble turning the boat. Because I lost my engine in a bad storm a while back and have only the use of my sails right now, I had to use my oar a few times just to get enough power to turn the boat to the correct tack. Thankfully I have oars - because if I had not used the oar I would have had to fend off from the docked boat I was coming ever closer and closer too! So I finally made it out to the main channel. 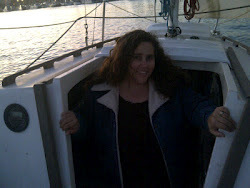 It began to get a little cooler at night on the water with the wind in your face, so I donned my windbreaker. And after a while the wind got a little stronger so I then had to put on a warmer coat over that. Nevertheless, even with the stronger wind (which was still comparatively light), it still took me two and a half hours to sail to the breakwater (an hour and a half longer than usual with regular wind conditions). 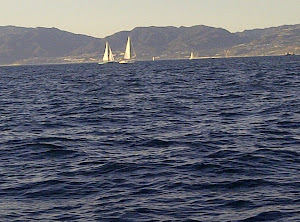 When I got out past the wall, I stayed out at sea in the lake like conditions tonight for about an hour. I say 'lake like' because the waves were only a foot or two high. Out there, the waves brush constantly against the boat. The moon shines down upon you. I feel like I have gone to a different land: The Land of endless water. A place so very distant from my ordinary life at home and work. Here the stress is completely different. If there is stress (which is not very much tonight) it is in the form of a broken or damaged shroud, a bigger wave than normal or getting 'caught in irons' when the wind is light and I am trying to tack. Wind and rain in my face don't help either when things get bad. But that is far away from now. The only thing I worry about this evening as I sit on the bow and enjoy watching the wind in the sails and the bow cut through the deep dark waves, is running out of wind. But that never happens. The wind stays steady and I arrive back safely. When I got back in to the Marina I could see the glowing lights of two big party boats coming my way. I was glad I had my navigation lights on and my lantern too so that they could clearly see me. The idea of being run into by these big boats was scary! The wind was now at my back coming down the channel. There's a strange peace having the sails all the way out and gliding through the peaceful water at night. To my right I could see the Santa Monica mountains and the distant lights from that area. The sound of music came across the water from the party boats. With the light winds behind me, I was going much faster into the harbor than it took me to get out. While coming in, I dozed off a few times for a couple of minutes. That wasn't going to work so I then made myself some hot chocolate to stay awake! Unfortunately this only helped a little while and I then I had to make myself some tea and ate my snickers to stay awake. The chocolate tasted so great with warm tea. Its funny but things taste differently out in the elements than they do at home. Having something warm really helps. The lantern was turned up bright and the big party boats saw me as they passed by. The wind was steady at my back all the way into the slip and I was happy to turn the corner and get home. 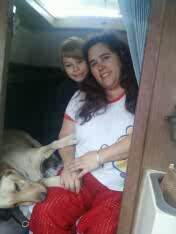 So was Buttercup and was off the boat even before the dock lines were secure! Twenty Three Hours At Sea! A million and one stars greeted me in the dark sky. As I ran before the wind with both sails out like wings, one hundred stars disappeared behind the mainsail on the starboard side and one hundred behind the jib on the port side. As the mast head swung from side to side in the ocean swell, ten new stars reappeared from behind the sail and then were lost again from sight. It was amazing! Eventually the wind came out with gusto and I was already five miles out to sea sailing along the mountainous coast of Malabu. Mysterious lights on the mountains glowed yellow and gold as I passed. 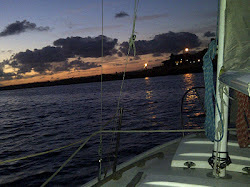 My green port light on the right side of the boat 'waved' goodbye! This weekend I had driven down to the marina wanting to sail as far out to sea as possible in one night and still be able to get back in for Christmas eve the next day. So I left the dock around 9:30 in the evening - just in time for the wind to die down for the evening! It was a very unusual time to leave and as far as wishing to get far on the power of the wind alone - a big risk. But It didn't seem to matter to me tonight. if I had no wind, I was just was going to go as far as I could and if that wasn't far - then so be it. But my long shot hopes seem to pan out. As I soon found out, the wind was far from being over! Soon I was out of the harbor and way out to sea. 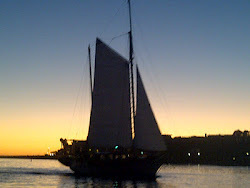 Now the bright stars and youthful wind played with my imagination as I sailed on. By 2 AM I was tired and made a temporary bed in the cockpit so I could keep watch between cat naps. I laid down my sleeping bag upon my cabin cushions and then over my sleeping bag I put my itchy blanket (which I found to be dew resistant!) As there was a lot of dew at this time of night - that itchy blanket was the difference between waking up with the sleeping bag all wet or nice and dry. 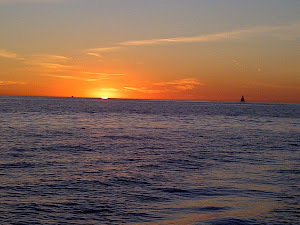 I scanned the horizon but as usual at this hour, it was void of all boats. It had been for hours. So I felt relatively safe cat-napping for fifteen minutes at a time between watches. This worked fine most of the night as I kept waking up and viewing the horizon for any little moving green, red or white light on the ocean. But my report always came back empty, so I just went back to sleep. Sometimes the wind would change slightly or the boat sails would need re-adjusting, so I would blindly reach out and turn the tiller an inch hoping that would do the trick. Sometimes it did and other times not. At any rate, I kept this procedure up all night until about 5am when my body temperature really dropped and I had to go in the warm cabin and cat nap for an hour. About 6am I came back out in the cockpit and noticed that the dark night sky was turning to grey. 'The sun will be coming soon', I thought. So I lied on my 'bed' with my hands behind my head and watched the early morning sky. 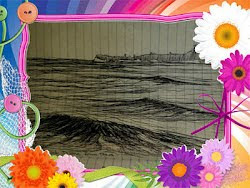 The mountains began to turn a light maroon color and the dark sea turned grey. Then all the mountains on the eastern horizon and the island of Catalina to the south were highlighted as they turned a brighter red. Soon they all turned orange and before I knew it the sea was this beautiful blue highlighted against the brilliant orange mountains and sky! What a sight. I sat there in disbelief at such an amazing scene. I thought how blessed I was to be able to see this. And then like the burst of flame from the ashes, the golden gleam of the sun suddenly flashed in the east. Wow! How amazing. But then everything started to change. Soon the colors had left and the morning blue sky had returned. The morning was born and with it - sight of where I was. Point Dume was there off my port bow - still an hour away. And now the mansions and 'castle' like estates, high up the malabu mountains, were clearly visible. I was still a little too far out to sea and I wanted to come in toward land a little closer. So I pulled in the jib and mainsail tighter and headed north west into the headwinds that were coming sharply down the coast. In half an hour I was nearer the shore (about a mile) and could see the sandy beaches and all the big homes right along the edge of the water. Many had large pylons and pillars holding them firmly up on the sand. This was as close as I wished to go as I could see where the wind petered out nearer land. My wish had been granted and now it was time to think about heading back home for Christmas eve. I still had eight hours to get back to the marina and that seemed like a good margin. It didn't feel like I was trying to cut it close and I was happy about that. So I texted my wife my approximate time of arrival and then turned the tiller, aiming the bow eastward. During the night and in the early morning hours, the wind had been full of zest. 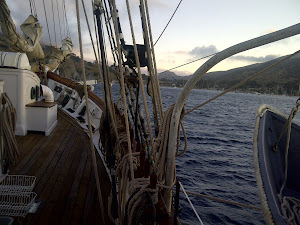 But now the wind was light - an interesting flashback to my voyage out here a year before. But I was full of hope for a normal day at sea - which included fair winds at key times of the day such as after ten in the morning and around 2pm in the afternoon. The morning winds were in order - though light. But by the time I could clearly see Santa Monica Pier - the wind had died. And of all the strangest things - it remained that way - for five long hours. I suppose out of every ten or twenty days at sea, that one is unusual like that and has no afternoon wind. I was astounded that this one day out of twenty was to be my lot. So for what seemed like eternity, the boat moved like a turtle through the water - only getting some forward motion from the waves - which made the boom flop backward and forward, creating enough energy for 1MPH of speed! Having no control over these events, I became frustrated - realizing that I may not be able to keep my committed time to be home for Christmas Eve. 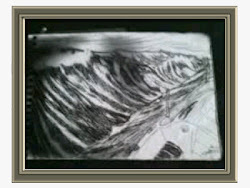 Deciding to do something constructive with the time I then began drawing the mountains in my captains log book. Then after this I read books and ate food. I then realized how tired I was from cat-napping all night and could rest now with more ease as my boat was clearly visible in the day time. 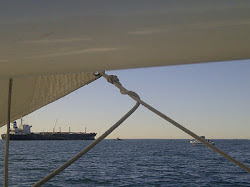 So I took a pillow out onto the bow and in the wonderful shade of the jib, fell asleep for hours! Since I was miles from land with hardly a boat in sight it was okay. When I awoke, the wind was still dead, so I just sat there taking in the amazing view of the sea from the front of the boat. By evening time, a little wind returned and I got the boat moving along with it. Now another fantastic view presented itself. As the sunset turned orange on the horizon, all the windows that were angled correctly along the coast, reflected the setting sun and appeared like gold flashing stars on the dark mountains! 'Constellations' of golden stars now appeared and it blew me away. The sunset in itself was beautiful too and I raised my hands up to heaven to praise God. Then the wind came - this time with some gumption. 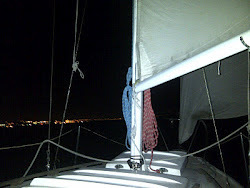 Happily I pulled in the jib sheets tight and sailed for Marina Del Rey. I had been out at sea for twenty three hours and it was time to get back. Christmas Eve with my family at home was waiting and I was anxious and excited to get back. As I sit here in the cockpit watching the waves go by, I realize how hard and intricate the sea is to explain fully. In some ways its kind of like describing God. Like explaining His voice sounding like the voice of many waters. Try explaining that and you'll know what I'm getting at. Its something so amazing, something you feel deeply. Whenever you may try to describe it, it is more awesome and beautiful than you can write. You just have to be there! Out at sea the ocean waves roll against the boat in rhythmic motion. They are bigger tonight than last week and sometimes appear quite large - even 'ginormous' by normal standards. I'm not talking storm waves - that's a whole different story. I'm explaining the difference between gentle days and those crazier ones. One wave rolls in - appearing like a wall of water. Not like a wall the size of a house - like in a gale. Just a regular wall size wave. The boat coasts right up its side without hesitation. Sometimes I get caught in big ocean swells. Its like coasting down the side of a small hill into the valley with another 'hill' like wave on the other side. As all this happens, little birds rest on the waves and then fly away. The sun is getting near the horizon. Its glow is a bright gold over the water. The rhythm of the waves creates sounds in the rigging. The wind whistles through the sails. Sitting on the bow rail and watching the waves go by below my feet is another one of those things that's hard to explain. But I wouldn't trade it for a hundred other things. Coming in the harbor from out at sea and the wind was driving at me. The wind normally comes from the west and as you come into the harbor, the wind naturally tends to swing around and be in your face. I could see the American flag on the breakwater, waving hard in the breeze. 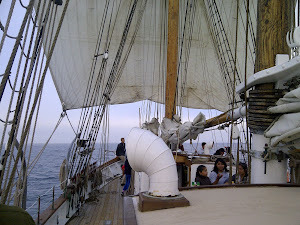 I pulled the jib and main sheets tight and the sails were pulled in snug, harnessing the head winds. The golden glow of the fading sun shone brilliantly against the large windows of homes at shore. The mountains of Malabu, now behind me, appeared large and purple set against the blue ocean. 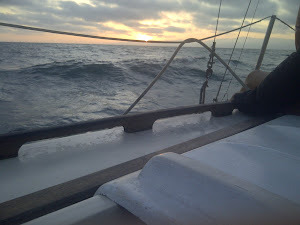 I turn east now to go down the large channel and suddenly the winds that were driving so hard at me are now at my back. I open the sails out like wings now on the left and right and the winds push the boat with all its might. Gale Winds, Six - Ten Foot Waves, Ripped Sails and Five Feet from the Rocks! Three quarters of the way out of the marina and everything was waiting to fall apart. The wind's pressure on the mainsail was intense. And it wasn't so much this that worried me. It was the pressure the wind was having on the mended section of the sail. So far everything was okay. But for how long? At noon that day, I had got ready to head out into the madness. But the howling wind and fast moving water still intimidated me! I wondered if being patient and waiting a couple hours might help the storm to blow over. But on the other hand, by 2:00pm the storm could be worse! I then added the coastal winds into the equation (they are just heating up by then). The thought then occurred to me that even though 2pm may be worse, the winds would surely be softened a couple hours later at sunset when the coastal winds died down for an hour. Ok, that was the plan. At least then I wouldn't have raging winds the whole time. So I held patient until 2:30 and then headed out. 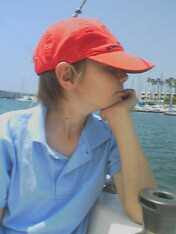 When I lit out, the winds were strong and gusting and many times turned the boat 30 degrees on its edge. The water was very close to the cockpit when the gusts came and everything in the cabin that wasn't snug, came loose and fell all over the floor. So far Buttercup was doing okay in the v-birth and she didn't seem to mind - at least not yet! Examining the sails, I then suddenly saw a tear in my front small jib. It was half a foot long. The thought of continuing to sea entered my mind but then I lost all my votes very quickly. But you know me: If there was a way to go out to sea - I would find it. Putting my storm jib up was an option and the winds were strong enough for it. So I went for it. Soon the tiny sail was up and pulling the boat. Almost as suddenly as that was done, I looked up and saw a tear in my main sail - three quarters up. Thankfully the mended part was still holding fine. Man, that mended area had held up in some crazy weather! So now the main sail had to come down. Again I voted down going out to sea. What was I going to do now? I had a backup tri-sail for the main. But it was for 40MPH winds. It would not work today as the winds were about 20- 30 today. Oh hey! I could use the genoa. That would work. So quickly I brought it out and attached the foot, head and clew. I then headed up into the wind as best I could under storm jib alone and then pulled it up with the halyard. But to my amazement and dismay, it began to fly outwards like a mad spinnaker! It had nothing to hold it against the mast. Now What? I have to admit, I was working hard! On every tack the boat made from the port sea wall back to the starboard wall, I had to judge how close I was and stop everything I was doing and turn the boat. But it wasn't as easy as I imagined. 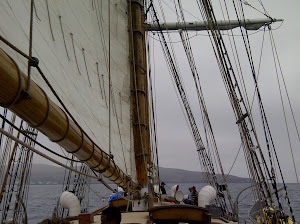 With only the little storm jib, I couldn't head up very well into the wind and turn. So my only other option was to jibe - which worked like a charm - except that I lost valuable 'ground' every time I tacked. As I headed the boat downwind and let the jib switch its angle, I then went back up onto the cabin deck and to work again. I had to figure out a way to hold the genoa to the mast. It then dawned on me: I could cut strong pieces of string and tie them around the halyard (which ran up the mast pole) and then clip the sail hanks onto these tied strings. Soon this was done and I pulled the genoa up the mast and behold - my new main sail! Well, it worked alright but then I had a new problem: it was closing in on sunset and just as I had speculated - the wind speed decreased dramatically and now my sails were too small for the wind blowing! So quickly I got to work and fixed my main sail rip. While that was going on, I suddenly noticed I had drifted really close to the port sea wall. So no problem - I should be able to turn with the make-shift mainsail - right?! Well I made a bet on it and it was a bad bet. I only had one chance at this and that was it. But I was so sure the boat would turn - I didn't think. And - you guessed it - it still wasn't able to cross the wind! Ok, now I was in a real fix. And as I looked down at the water I noticed I was only five to ten feet from the rocks! Now there was no jibing as I had done previously - because if I did so the boat would hit. So what to do now? This was it, the time I finally crashed on the rocks! And no time to even call the coast guard. A flash of the agony I was going to feel when the boat hit went through my mind. Suddenly, I remembered my oar. Well it was worth a shot - there weren't any other options! I then paddled as hard as I could. Every stroke I dug into the water like it was the end of the world! Seconds later - presto - it worked and the boat turned away from the rocks! Thank you Lord! So now after having avoided this disaster, I still needed to get the mainsail up. 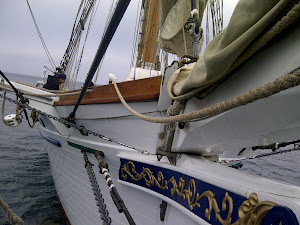 Taking the genoa down and putting it up to the front of the bow where it belonged, I then raised the mainsail. After all the endless work, finally the boat was saiing again! I felt exhausted, and my back hurt. It was so great to finally sit down! So now I headed out to sea. I had already got my safety tether ready and now I put it on. The hatches were closed and the front ones locked. 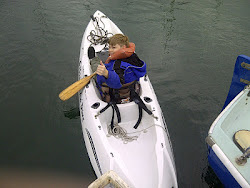 My life jacket was ready, the safety line connecting bow and stern was up in case I needed to clip my safety harness onto it, and the kayak had been brought to ride only four feet from the stern. Earlier the ocean had been a mess with white water and large cresting waves. Now it was dark and it was really hard get a view of how bad it was. But usually when heading into big waves at night you have a couple minutes to turn around if its too bad. So heading out into it, I turned the lantern light on the starboard side to shine out to sea so I could use my night vision without it blinding me. The first thing I noticed was that the waves were generally about six feet and not cresting or white. With the wind having slowed slightly, the fierce waves had been subdued somewhat. Nevertheless, they were still big, but the boat rode up them without any qualms. I was really thankful the waves were not bigger and cresting. I had been in waves like that and it was right on the edge of terrifying. As I got further and further out and the breakwater and harbor lights began to disappear far behind me, the only reminiscence of those breaking seas was the sudden height of a ten foot wave that suddenly came out of nowhere. Just as the boat should have reached the top, I looked up and saw three to five more feet of wave to go! I rode it to the top and then the boat dropped into its deeper trough. Fun and a little scary at the same time. I then rode as far out to sea as I dare among the dark waves and then tacked back towards the northern entrance of Marina Del Rey. The wind was out of the north west so coming back was a bit of a beam reach. This was the really fun part as I was going quite fast - almost as fast as the waves - and I would ride the tops of them. Sometimes those ten footers would come along and the boat would surf them! I tried to video it but darkness of night was mostly what you could see and the sound of the wind made up most of the sound. The distant lights ashore showed up but the size of the waves and the surfing fun was all lost. Tacking twice before arriving in the harbor, I then headed in with a full breeze. Just about the time I was ready to enter my slip, the wind had switched to the north (from behind me) and I had to take the mainsail down so the boat wouldn't come in like it had rocket boosters on! Sailing Pictures Say a Million Words! I will begin by sharing the stories that go with each of these pictures! My Daughter Sailing with Me! I'm out in the rain storm, while she's all happy and dry! Puppy looks like Buttercup, huh! 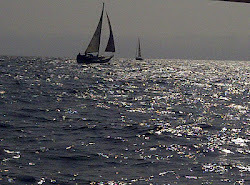 Lovely afternoon as I sailed by watching the other boats at sea. Sailied out to Point Dume on Malabu Coast. Book a Boat almost ANYWHERE in the World! Come on by Albie's main page! I was kayaking behind my boat when I took the picture. 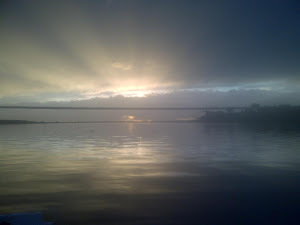 CLICK Pic to go to Albies Sailing Blog! Come see my Pirate page! Click on the pic. Sailing with sails set on opposite side. Wind blowing from behind makes this possible. A mile off shore. The distant lights on shore can be seen. We liked to pretend we were Greeks sailing with a huge Foresail! Square sails set on Irving Johnson. CLICK on pic to go to Pirate Albie's Page! I knew Janette Could Come Sailing!